The internet abounds with techniques and tips, giving the illusion that in a short amount of time it’s possible to master the answers to our problems. That may be true for, say, getting the most from a laptop. However, if we rely on ‘management techniques’ and ‘management by tips’ for running a business or launching a startup, we’re in big trouble. Isn’t the Theory of Constraints a collection of techniques? Some people may be tempted to think this is so. The Theory of Constraints provides a range of solutions for various environments: production, marketing and sales, accounting, replenishment, retail, and project management, plus the Thinking Processes for conflict resolution, innovation, strategy and implementation. If we regard these various solutions as ‘techniques’, then we fail to recognize something fundamental: the Theory of Constraints is totally immersed in a mindset and worldview that is systemic, one where what counts is achieving the overall goal of an organization and therefore working on global optima – what’s good for the whole, not protecting local interests (or silos). We were recently asked why for us the ‘Critical Chain’ approach to Project Management is more than a technique. In reply to that here is a quote for our book, ‘Quality, Involvement, Flow: The Systemic Organization’ form CRC Press. “Looking at Critical Chain as a technique for managing projects means essentially missing the point. The reason why tools like Microsoft Project still dominate the way projects are “managed” after almost two decades of relentless efforts to disseminate Critical Chain is that any attempt to use Critical Chain without embracing a purely systemic view of the organization is doomed to failure. The problem with techniques is that they tend to remain superficial. And because they stay on the surface, we can’t internalize them. And because we can’t internalize them, techniques can’t transform us or the organizations where we work. Only knowledge can. The knowledge exists. The Theory of Constraints and the work of W. Edwards Deming contain all the elements of knowledge required to transform management away from the underperformance of silos towards whole system management, allowing the true potential of organizations and those who work for them to be unleashed. It may take longer to acquire knowledge than a technique or a tip, but it sets you up for the long-term. 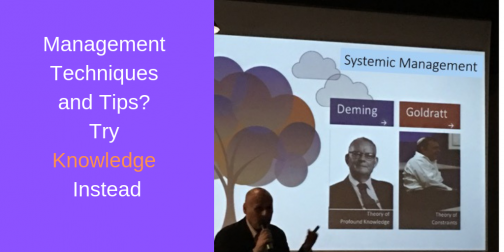 Since 1999, we have been presenting a new model for a systemic organization in detail, both in terms of the thinking behind it and how to conduct operations. We work alongside CEOs and Executive Teams to support the shift towards more effective, systemic strategy and operations. Our books include ‘Deming and Goldratt: The Decalogue‘, ‘Sechel: Logic, Language and Tools to Manage Any Organization’, ‘The Human Constraint‘ and most recently, ‘Quality, Involvement and Flow: The Systemic Organization’ . We support our international clients through education, training and the Ess3ntial multi-project software using Critical Chain to schedule competencies and unlock the potential of human resources. Based on our proprietary Decalogue methodology . The post Management Techniques and Tips? Try Knowledge Instead appeared first on Intelligent Management.